There's quite a few excellent remote receivers running WebSDR but unfortunately the author has decided only to give the software to agree to make their server publicly available. I think it's a pity that this software is not available for people wanting to share their home receiver with, perhaps, a few friends. It's also a pity that this software isn't open source. An alternative is the excellent OpenWebRX by András Retzler. 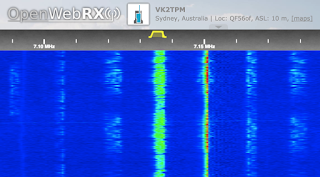 In the ARNSW home brew group we have a regular contact on 80 or 40m but often we can't hear each other due to local noise. It's been proposed that we place a remote receiver at a low noise location and all listen over the web. 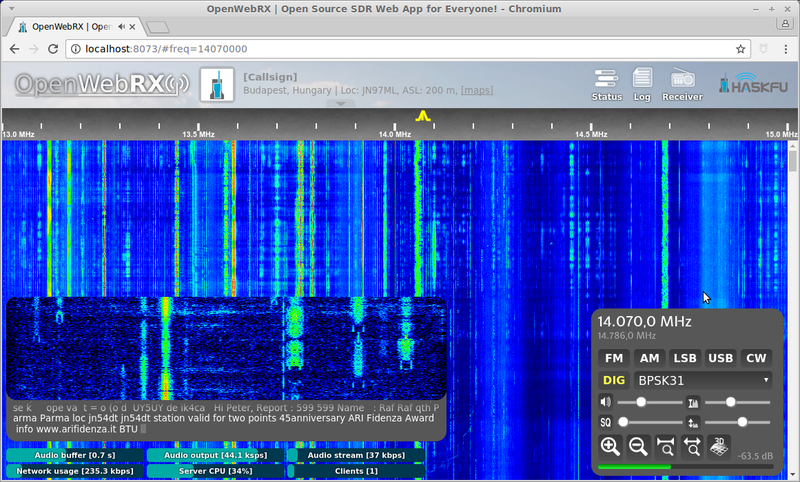 One idea is to have a fixed receiver simply stream the audio, another is to set up a web SDR. I'm investigating running this on a Raspberry Pi. The software is available from GitHub here. Everything is in the readme to build and install, I did little except follow the instructions and install missing things as they came up. Let me know if you're stuck. Because I'm currently running an RTL-SDR in direct sampling mode I had to build a fork of rtl-sdr that supports this. OpenWebRX is a terrific piece of software, easy to build and run, and I want to thank Andras for his contribution. If you do have a fast internet upload and a permanent receiver you can add yours to the list. The RTL-SDR doesn't work very well on HF like this so I've now switched to using a HackRF One that's working quite nicely. The AGC is rather savage but it's good to listen to overall. The WebSDR author must get that request constantly. I've also emailed him asking if he had a "personal use" version of the software. No dice. Fortunately, OpenWebRX is becoming a much better alternative. In defence of WebSDR I requested the code a few years back but when I realised the sound card I purchased for the Softrock (192kHz under Windows) had drivers limited to 48kHz on linux and the spare PC I considered using would be eating 95 Watts for 48kHz of HF I gave up,(this was a good few years back). If he had too many like me it must be frutrating to waste emails, I honestly did start with good intentions. 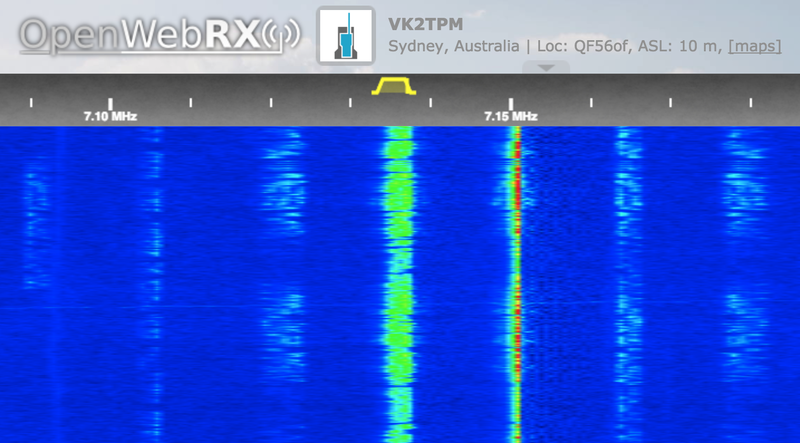 These days with PI's and KiwiSDR I'll stick with OpenWebRX. Back then I didn't have the kit but did have decent noise levels, now I have the kit and high noise (QRM).